At the Wallace Collection, located a few streets north of Selfridges in London, there are fine displays of Old Master paintings, 18th-century French art, arms and amour and a treasure trove of Sèvres 18th-century porcelain. The Wallace Collection is a national museum, but as these artworks are held and displayed in a majestic, London town house, the exhibits are enhanced by being placed within elegant, well-proportioned rooms. In particular, the extensive world-renowned collection of French 18th-century Sèvres porcelain benefits from being displayed within these rich domestic interiors of a former private residence. This porcelain is known as Sèvres as Sèvres, Hauts-de-Seine, France is where the royal factory was relocated to in 1756 and where it remains to this day. Although originally the factory had been founded and supported by King Louis XV in Vincennes in 1740 to produce china in direct competition with Meissen porcelain produced in Saxony. Sèvres porcelain cup and saucer, 1760. Pale turquoise blue ground overlaid with a trellis pattern, painted with flowers by François Le Vavasseur. Acquired by 1842. Sèvres cup and saucer decorated with bucolic scene. Sèvres china is made from soft-paste porcelain which is extremely fragile in the kiln. Many of these pieces have been fired five or more times depending on the complexity of the glazing, the painted decoration and their final gilding. Sèvres cup and saucer porcelain, 1767. Decorated with a rich frieze of roses, garlands and rosettes by Jacques-François Micaud. Acquired by 1834. The displays include the expected tea wares as well also porcelain vases, candelabra, the odd inkstand and even an ice-cream cooler, but it was specifically the beautiful, delicate cups and saucers that I found most charming. Originally they would have been used for tea, coffee or chocolate and what a delightful treat to have sipped a thick sweet chocolate from one of these. Sèvres porcelain cup and saucer, 1765, (height 8.3cm, diameter 15.3cm), with a rare and an unconventional shell-like decoration. A design that reflects the thirst for novelty which inspired much innovation in the decorative arts of 18th-century France. The shell-like pattern was probably painted by Méreaud le jeune. 21st April 2016 – 90 not out, but let’s remember . . . There might be a few corners of the world where a certain birthday is going unnoticed, but that wouldn’t be Britain. Apparently, it’s a good news story and folk like a good news story. This morning I heard a radio clip of the Queen when she was very young speaking of the time when, incognito, she and Princess Margaret had joined the celebrating crowds on the Mall during VE Day, May 1945. She would have been 19 years old and it reminded me of a notice I’d recently read when visiting the Bomber Command Memorial in Green Park, London. More than 125,000 men flew in Bomber Command and all were volunteers. Of this number, nearly half lost their lives (55,573). Most who flew were very young, the great majority still in their late teens. The RAF Badge inscribed on Portland stone of the Bomber Command Memorial. The badge has been used since 1918 with the RAF motto ‘Per Ardua Ad Astra’ – ‘Through Adversity To The Stars’. It has taken 70 years for this memorial to be erected and it was unveiled by the Queen on 28th June 2012. The memorial was designed by the architect Liam O’Connor and is made of Portland stone and echoes the nearby 19th-century Ionic Screen gate by Decimus Burton at the entrance to Hyde Park. Within the central part of the design, raised on a plinth, stands a bronze sculpture of seven statues. These statues represent the aircrew of a World War Two bomber and were created by the sculptor Philip Jackson. From the left navigator, flight engineer, mid-upper gunner, pilot, bomb aimer, rear gunner and wireless operator. This Memorial is dedicated to the 55,573 airmen from the United Kingdom, British Commonwealth and Allied nations who served in RAF Bomber Command and lost their lives over the course of the Second World War. This Memorial also commemorates those of all nations who lost their lives in the bombing of the 1939-1945. My Great Uncle Rich was a Pilot Officer who flew Lancasters in 57 Squadron. It was incredible that he survived the war. I remember him as a quiet, gentle man who perhaps never recovered from his 80+ active flights. He did receive the Distinguish Flying Cross, but I never heard that he talked about his war experience. And, there are no stories if he joined the celebrating crowds in the Mall on 8th May 1945. Author agnesashePosted on April 21, 2016 Categories Contemporary Culture & Design, London, SculptureTags aircrew, airmen, Bomber Command Memorial, commemoration, DFC, Great Uncle, Green Park, London, memorials, pilot officer, RAF11 Comments on 21st April 2016 – 90 not out, but let’s remember . . . I think I was there! I recently exhibited at an art fair in Chelsea, London, and the promotional video has now been uploaded. A little word of warning it does contain several seconds of extremely fast cut rate – I’m guessing something to do with fitting images to the soundtrack. Along with myself there were over 50 artists exhibiting and this video certainly shows how busy and crowded the event was showcasing fine art, drawing, photography, sculpture, ceramics, textiles and jewellery. Sadly, the most outstanding, beautiful pieces are not shown at all – that was a range of glorious blue ceramics by a woman from the west country. And, that isn’t just my opinion. It was the buzz from quite a few of my fellow talented and knowledgeable exhibitors. Looks like the ‘craft’ part didn’t make the cut. Author agnesashePosted on February 25, 2016 March 2, 2016 Categories Contemporary Culture & Design, LondonTags Art Fair, commentary, exhibitor, London, Parallax, review, reviews, short promo video4 Comments on I think I was there! There was no doubt about it, most of the people that stopped to talk to me at the Parallax Art Fair last weekend were curious about my slightly unusual wall hanging. Older visitors remembered their grandmothers hooking or progging rag rugs during World War Two and recognised the technique, but were not used to seeing luxurious fabrics in rich colours to make such textiles. Interestingly, several overseas visitors, particularly from North America, paused to chat explaining about their tradition within folk art for hooked rugs and hooked wall art that is still popular. Design for Hilarion wall hanging is drawn out onto hessian. Gradually more and more of the silk, velvet and wool is hooked into the hessian. For my work it felt quite natural to start using all the painted silk off-cuts I’ve kept over the years. I suppose I could have made sewn, patched pictures, but I was more interested in achieving a deep, tactile surface. And, having said that, most people did ask if they could touch this wall hanging. More than one visitor enquired whether it could be used as a rug. Technically it could, but I don’t think the silk areas would wear very well as the fabric is quite fine. Of course, if I had made it entirely of wool and cotton it could be a rug. I still use my recycled blanket wool rag rug my late mother prodded (or progged in some regions) for me – 11 years on my kitchen floor and still going strong! But this piece made with velvets, silk taffeta and my painted silk remnants has really been designed to hang on a wall. Curiously, I have found it very difficult to photograph and for once it really does look better in real life. ‘The Disintegration of Hilarion’ (150 cm x 67 cm) finished. It shows a deliberately damaged, defaced area and gives the appearance of the paint and gilding falling away revealing the panel beneath (actually that is dyed hessian with lines of metallic paint). For sale at Agnes Ashe. I shall be at the Parallax Art Fair (G37) on both days – if you’re around the King’s Road area of London come in and say hello. As I’ve been very busy preparing my work for this show at the Chelsea Town Hall, London, I have only just noticed this catalogue has been uploaded! The whole catalogue of all artists exhibiting can be flicked through here. It’s this weekend and FREE tickets are available. When I was younger I spent a year attending evening classes at the St Martin’s School of Art in London. I mostly remember arriving at the Charing Cross Road entrance on dark and wet and windy nights although it couldn’t always have been raining. St Martin’s School of Art, Charing Cross Rd, London sometime in the mid 1980s. It was an important experience for me culminating in an end of year fashion show with professional models. The evening show was extra special as the renowned British designer Zandra Rhodes attended offering her support and encouragement to the student/newbie designers. All cleaned up with replacement windows. Next door still needs some love and attention! Nowadays, St Martin’s School of Art has combined with the Central School of Arts & Crafts and is known as Central St Martins (CSM) and since 2011 is based in the King’s Cross area of London. This relocation has left the 1939 purpose-built art school site in the heart of London available for renovation and a new lease of life as retail premises and loft apartments. Although it is not listed the building is nevertheless an interesting construction of steel, brickwork, Cornish granite and Portland stone. It definitely has a 1930s feel about it and fortunately the recent renovations have not significantly remodelled its external appearance. From the street it looks very much like a successful ‘adaptive reuse’ and so much better than being simply knocked down to allow for yet another soulless glass and steel affair the likes of which seem to be springing up all around. Foyles St Martin’s Lofts designed by Lifschutz Davidson Sandilands. The beautiful peacock blue tiles by William De Morgan line the Narcissus Hall. Looking up at the rich detail of the 16th and 17th century Islamic tiles that decorate the Arab Hall. Leighton House Museum in Kensington, London, is a sharp reminder that bling and an overt display of conspicuous consumption is certainly not a 21st-century phenomenon. This glorious, ornate house was the private home and studio of Frederic, Lord Leighton (1830-96). Leighton was a painter, sculptor and illustrator, and a leading Victorian neoclassicist who was so successful during his lifetime he was knighted in 1886 and then ennobled in 1896 by Queen Victoria. Daybed/ottoman in front of fretwork shutters in the Arab Hall. Original 16th and 17th-century Islamic tiles (mainly from Damascus) and columns with carved capitals by the sculptor Edgar Boehm. His home, the house at 12 Holland Park Road, was designed and built by George Aitchison under Leighton’s personal direction and was to reflect his, Leighton’s, premier status as arbiter of taste. And, at the same time the house was to augment his successful career as an artist. 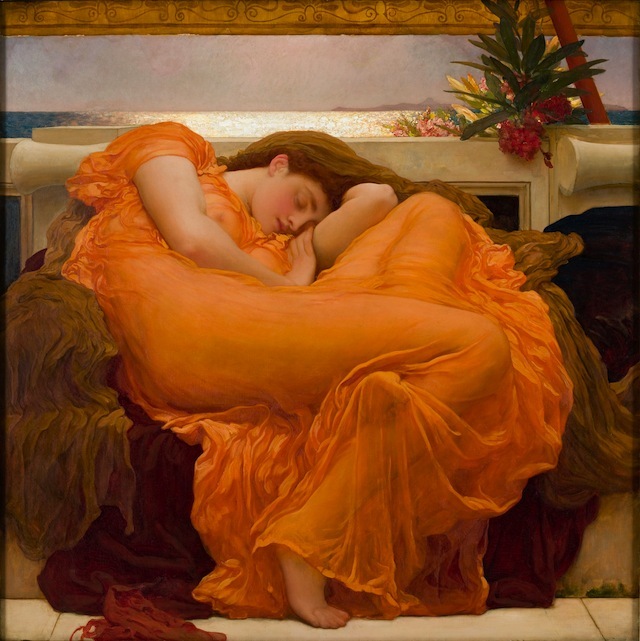 ‘Flaming June’ by Frederic Leighton. Oil on canvas. 120 cm x 120 cm. Museo de Arte de Ponce, Ponce, Puerto Rico. Art historically he is known as a neoclassicist however he did associate with some of the other famous Victorian ‘art celebrities’ of the period such as the Pre-Raphaelites Rossetti, Millais and Burne-Jones. Walking round the Arab Hall, the Narcissus Hall, the drawing room, the Silk Room and the studio you can imagine how sensational it must have been to have attended a social gathering hosted by Sir Frederic Leighton. 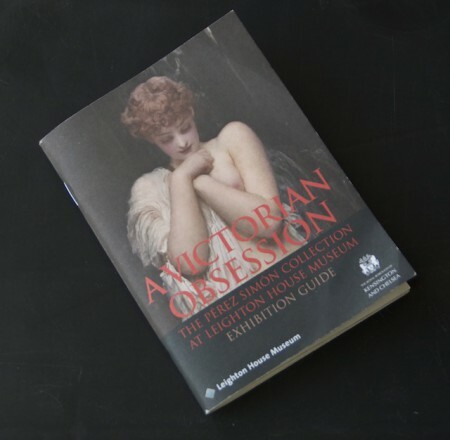 The current exhibition ‘A Victorian Obsession’ (ending on Monday, 6 April 2015) is comprised of 52 paintings that have been collected over the past 20 years by the Spanish born, Juan Antonio Pérez Simón, one of Mexico’s most successful businessmen. The art, mostly by Leighton and Alma-Tadema with a few canvasses from other artists of the same period, is displayed throughout the house. In my opinion hanging such an exhibition in this rich, original interior enhances the viewing experience and also provides the essential context for looking at paintings that are often viewed as saccharin and distant from our contemporary ‘less is more’ taste. Last night the final episode of Wolf Hall left us in no doubt how terrifying it must have been to live at the court of King Henry VIII. The whole series, like the books (Wolf Hall and Bring Up the Bodies), has been an intriguing observation of power and the manipulation of power. But, unlike other 21st-century historical fictional accounts of the Tudors full of 21st-century people dressed in costumes essentially behaving in a very modern manner, the characters of Wolf Hall evoke another time. Perhaps it is nearer to a true Tudor sensibility. It somehow has a feel as though this re-presentation (hyphen deliberate) floats out from the documents, art and culture surviving from the period. Last weekend I visited the ‘Real Tudors’ exhibition at the National Portrait Gallery in London and had the opportunity to scan across six different portraits of Henry VIII as I slowly turned on my heels. Putting the different styles and skills of the various artists aside, we are looking to find the essence of the monarch caught somewhere in the brushstrokes. As I stood and looked and looked, I realised how hard it is to see Henry the human being. The difficulty with these portraits is they are of a royal personage painted at a time when to be royal was to be almost a god. The other issue with these images is that some are copies of an original portrait or even copies of copies long lost in the last 500 years. In the end I considered we will only ever have an extremely mediated view of Henry and as with our contemporary queen, their public face is all about this strange, archaic notion of royalty and nothing to do with an ordinary human sitting for a portrait. I would show you these Henry portraits but, . . . 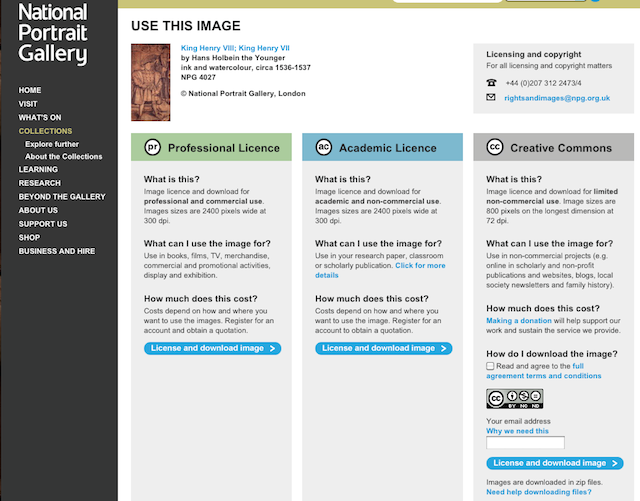 Wearing my Art Historian’s hat I find I have again to moan about access to public images held by a national art gallery. The National Portrait Gallery does not permit any photographs at all. In fact there are little signs here and there through the galleries reminding us not to take pictures. These images are part of a nation’s heritage and, of course, they are available to see and buy on their website, but that is not the same as taking my own shots. 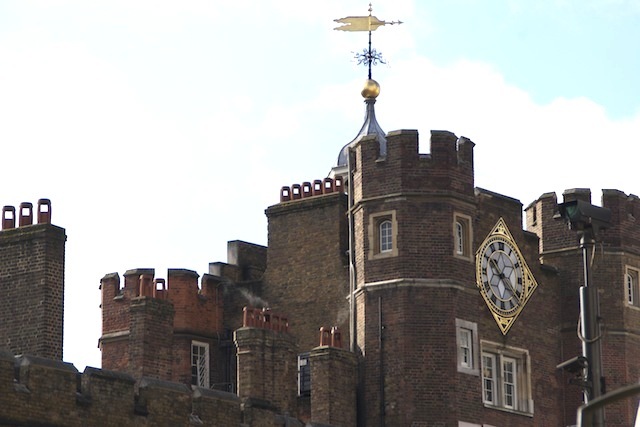 St James’s Palace, Pall Mall, London. Built as St James’s House by King Henry VIII. The original Chapel Royal, gatehouse tower, turrets and two Tudor rooms in the State apartments of this red brick building still survive. 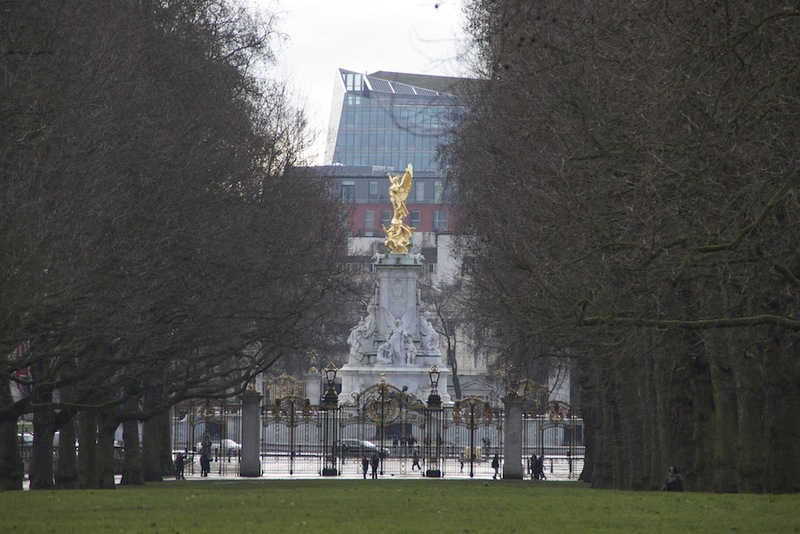 At least we are still permitted (and we are very, very grateful) to photograph royal palaces from the street. 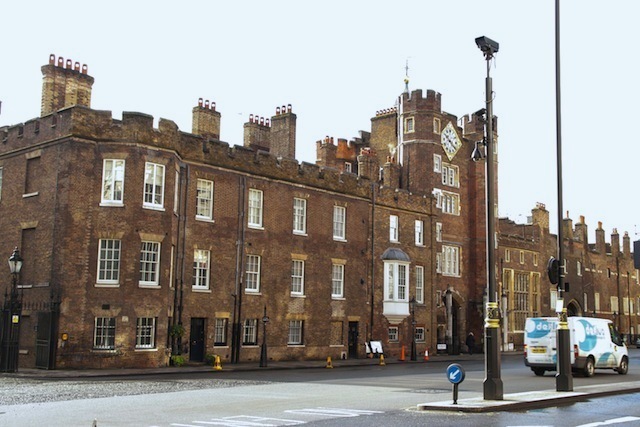 During the period between 1531 and 1536 Henry VIII had St James’s House built (now known as St James’s Palace). The Wolf Hall drama is also partially set during these years and today we can stand in front of the original Tudor gatehouse and imagine Thomas Cromwell riding through these gates perhaps to speak with Anne Boleyn the day after she was crowned queen. 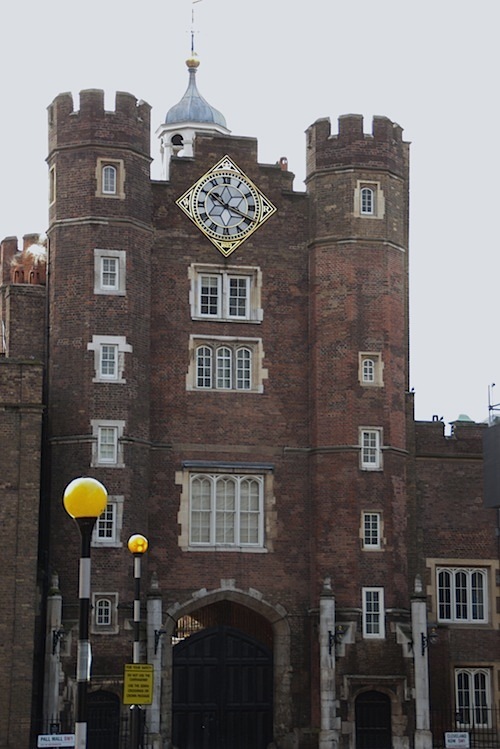 The Tudor gatehouse of St James’s Palace. Builders in Oxford Street, London. I am sure that there are new building projects being commenced all over the UK, but I was struck by the amount of renovation, rebuilding and new builds I saw last weekend in Central London. 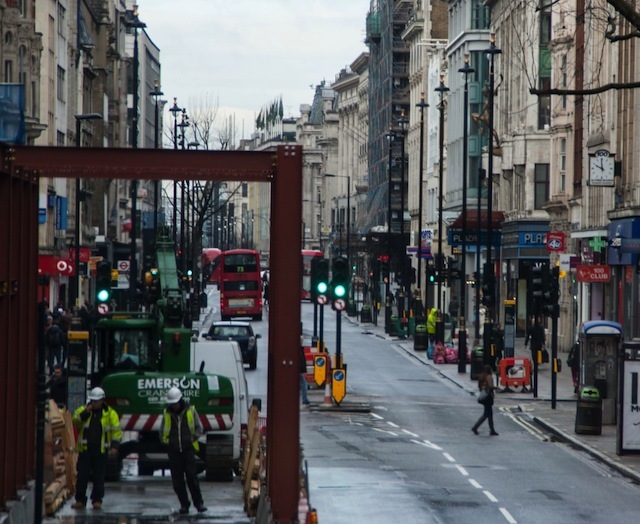 Building work spills onto Pall Mall. Building on Hyde Park Corner completely shrouded in plastic and scaffolding (shot through Wellington Arch). Of course, there is the amazing, ongoing massive underground engineering project Crossrail that comes to the surface every now and then and creates a major building site. Crossrail is a deep underground railway service due to open in 2018 allowing a traveller to cross from an area south-west of London to south Essex without coming up for air! A service more for commuters than tourists, but aimed to relieve Central London congestion. Elizabeth breaks through at Liverpool Street in January 2015. 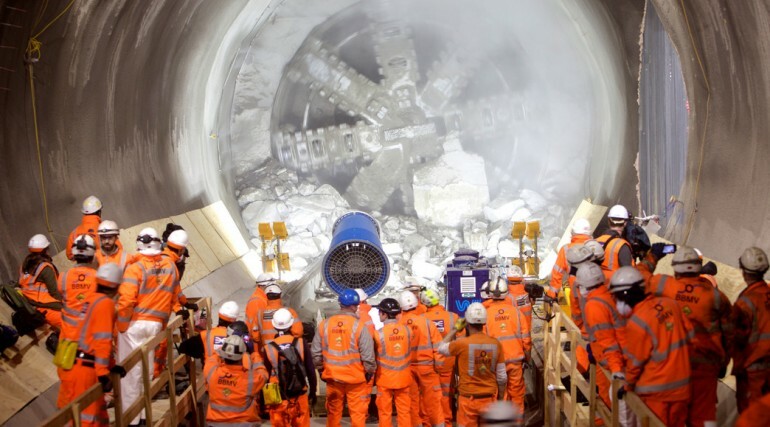 Photo from Crossrail. But back on the streets many London landmark buildings are receiving a little tlc and maintenance. 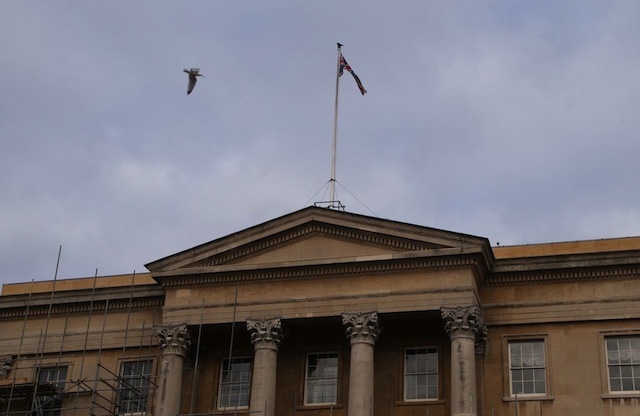 Apsley House, Hyde Park Corner – ground floor a muddle of scaffolding, but the neoclassical pediment is still striking. 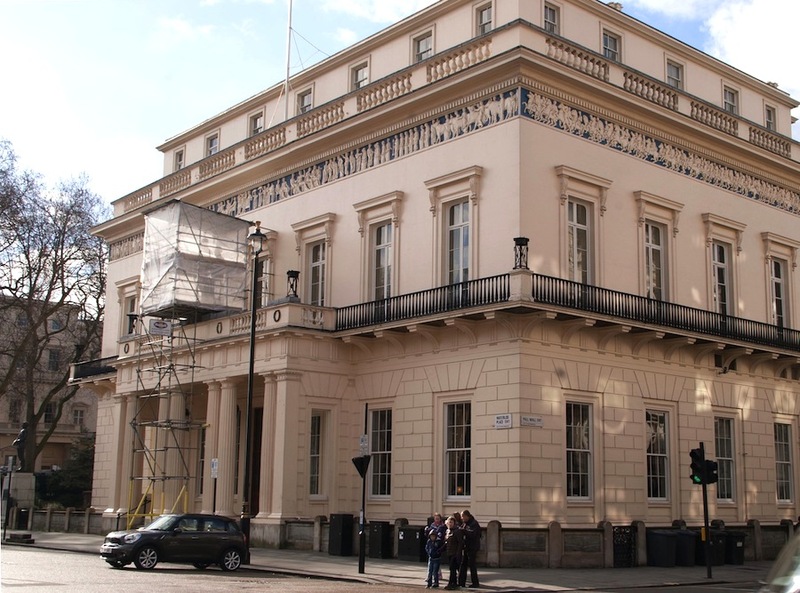 Even the prestigious and pristine Athenaeum on the corner of Pall Mall and Waterloo Place has a protective structure over their statue of Athena. It is a gilded work by Edward Hodges Baily and I’m not sure if the cover is due to renovation work or whether it is the statues annual protection to keep the worst of the winter weather from the gilding/gold paintwork. The Athenaeum Club, Pall Mall, London. Pristine neoclassic building designed by Decimus Burton. And, down the other end of Pall Mall the building work has spilled out over the pavement and another building under plastic is detracting from the beautiful St James’s Palace. Several renovations spilling out of over the pavement in Pall Mall. More plastic and scaffolding next to St James’s Palace, Pall Mall. Despite many buildings being smartened up even in Central London there are some prime position properties awaiting a visit from the renovation ‘angel’. Part of 90-93 Piccadilly on the other side of the road from these splendid gates opening onto Green Park. These houses, 90-93 Piccadilly are a grade II listed terrace that overlooks Green Park. It has an amazing view through a set of well-maintained ornate gates all the way down to the Victoria Memorial in front of Buckingham Palace. The parish church of St George, Bloomsbury, is a glorious example of English Baroque architecture. It was consecrated on the 28th January 1730 and is the last parish church designed by architect Nicholas Hawksmoor. 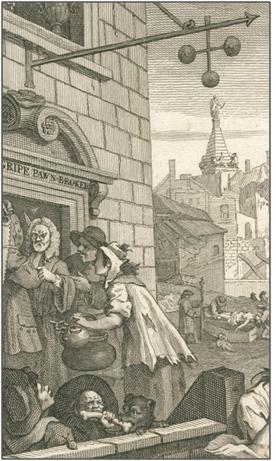 Within 20 years the church with its idiosyncratic spire (stepped like a pyramid) was a well-known building on the London skyline and as such appears in Hogarth’s famous print ‘Gin Lane’. 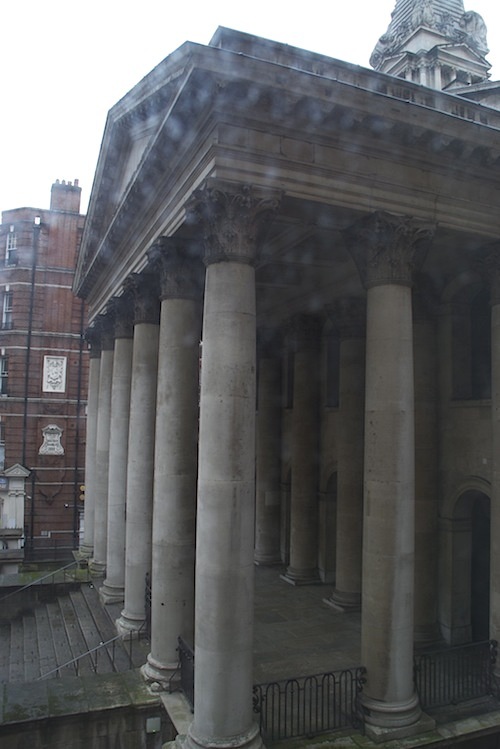 It has a very grand classical portico, but you have to look up 150 ft to the base of the spire to see the sprawling lions and rearing unicorns (best viewed with binoculars). Each 10ft sculpted animal is not an original as these were removed in 1871. The civic minded Victorians feared that in their decaying state a beast could crash down and cause a fatality. Fortunately, Nicholas Hawksmoor’s original drawings for this striking architectural ornamentation have survived and as part of an extensive programme of renovations in 2006, the sculptor, Tim Crawley, was able to re-create these dramatic pieces. 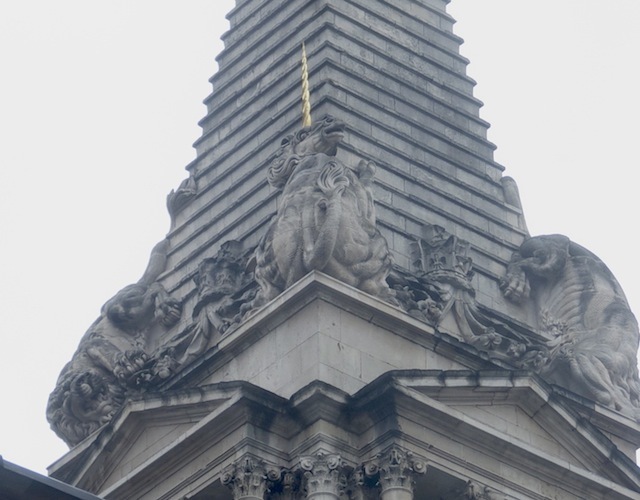 Hawksmoor’s interpretation of the ‘lion and unicorn’ theme has the animals fighting over representations of the English crown. Spire stepped like a pyramid with St George at the top and the lions and unicorns around the base. This provocative imagery displayed on a spire topped with St George was considered inappropriate by the Commissioners who initially refused to pay for the work. 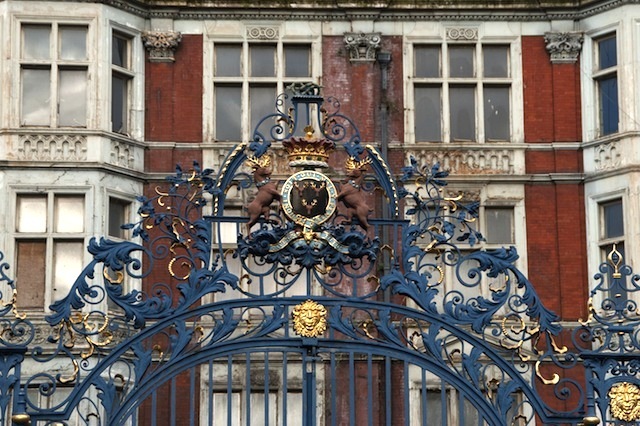 It is not that the lion and the unicorn used for architectural ornamentation is unusual, but that they are shown fighting over the crown. The lion represents England and the unicorn Scotland as in the traditional heraldic symbolism used from the reign of James I (1603) onwards. The pertinent point here is that at the time of the design and building of St George’s the dust was still settling on the 1707 Act of Union between England and Scotland that created the United Kingdom. 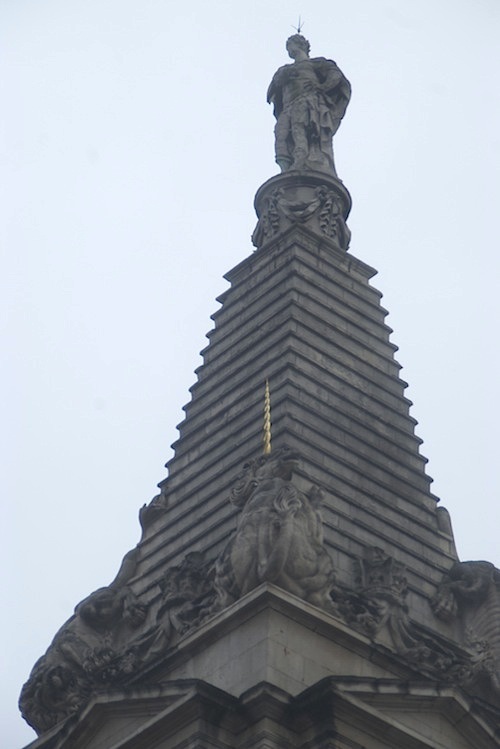 Detail taken from print with the St George’s spire clearly visible.